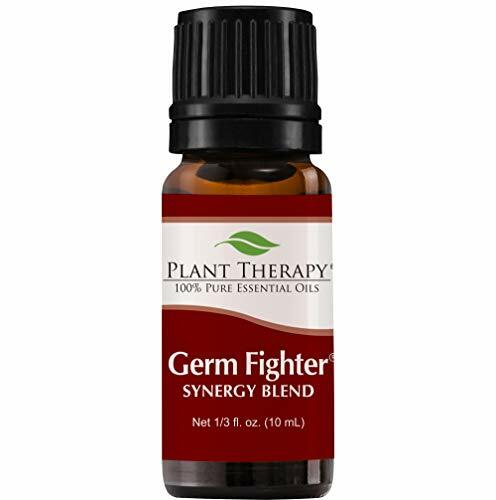 DEFENSE SHIELD FOR YOUR IMMUNE SYSTEM: Germ Fighter essential oil is a natural, organic blend of Lemon, Clove Bud, Eucalyptus Globulus, Cinnamon Cassia, Rosemary 1,8-Cineole. It's designed to support your immune system in fighting off germs; providing you relief and keeping you in good health. 100% PURE OIL CRAFTED BY EXPERTS: Our Aromatherapists use only 100% Pure, undiluted essential oils. Breathe in this therapeutic-grade synergy oil with an aromatherapy diffuser or mix with a Plant Therapy Carrier Oil and massage into your feet to fight colds, sinus healing and help with acute congestion. CERTIFIED AROMATHERAPISTS ON STAFF: Our customers are our #1 priority and we'd love for you to join the Plant Therapy Family. Our Certified Aromatherapists are happy to help you with all of your Essential Oil questions. In addition, we offer a risk free 100% satisfaction guarantee! 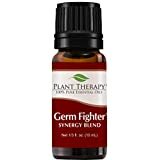 Plant Therapy Immune-Aid Synergy Essential Oil Blend. 100% Pure, Undiluted, Therapeutic Grade. Blend of: Frankincense, Tea Tree, Rosemary, Lemon, Eucalyptus and Orange. 10 ml (1/3 oz).